"The term craftivism was coined by Betsy Greer in 2003. 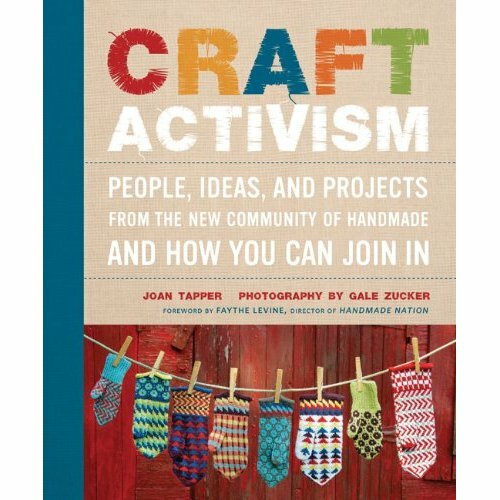 Mark brought up some great questions about what is Craft Activism on his radio show Creative Mojo 9-28-2011 podcast. The first one was how do the artists' in Joan and Gale's book fit it? 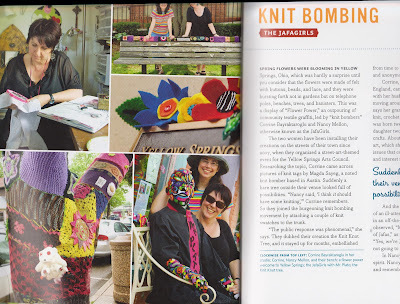 To be honest Nancy and I didn't think about doing knit bombing consciously as an activist statement (here is how it started) and I never really thought of myself as a crafter per se, although I've been doing crafts all my life. Activist, absolutely all my life one way or another, including with my art. I hadn't really stopped to think about it in the grand scheme of things, but looking back I realize just putting together the jafagirls and all our projects was a active statement against the supposed or normal way of doing things. 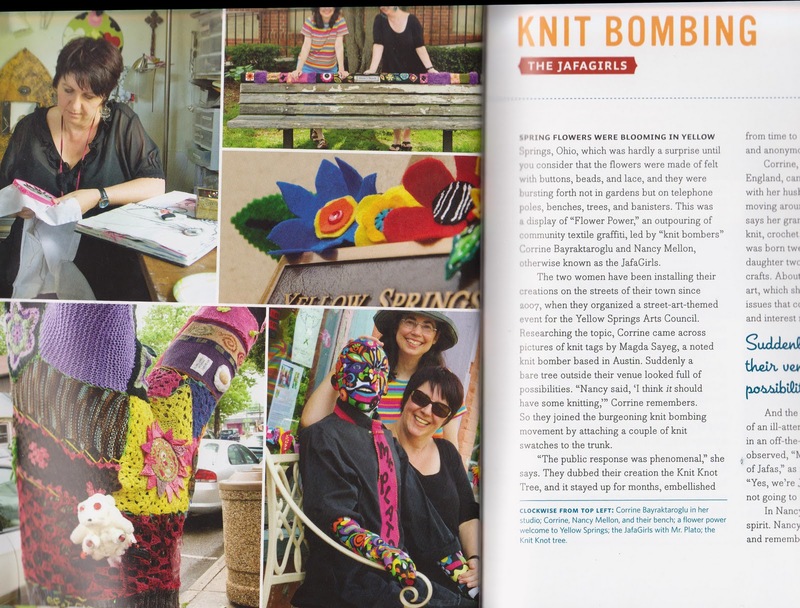 So is yarnbombing an activism of sorts? My answer is yes! It has challenged people's perceptions about yarn,public art, antiquated notions of what the homeless need, and their presumed knowledge of trees. It has inspired the young and old and brought together a community of sharing, learning and laughing. I am going bonkers with this one embroidery I'm trying to get done for the upcoming Jafagirl exhibit "The Hairy Art Palace" at the Yellow Springs Arts Council in October. Will be a guest on Mark Lipinski's Radio Show today. 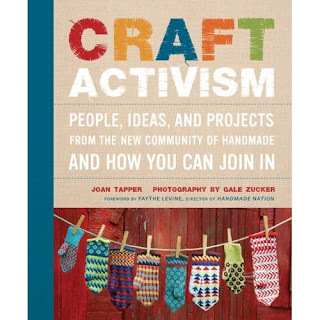 Mark is interviewing Joan Tapper and Gale Zucker about their book Craft Activism: People, Ideas, and Projects from the New Community of Handmade and How you Can Join In. wheeeeeeeee! the jafagirls are honored to be included in the book. I sometimes forget just how much Nancy and I have done, and then I'm reminded to update the jafagirl page and wham! I still haven't updated all the projects on the page. 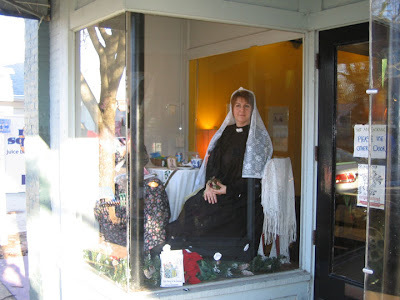 There was the time Nancy made me dress up as Queen Victoria (I named her Lady Muck)and sit in the local emporium window one Christmas and bemoan my loss, drink tea, and knight the occasional customer. 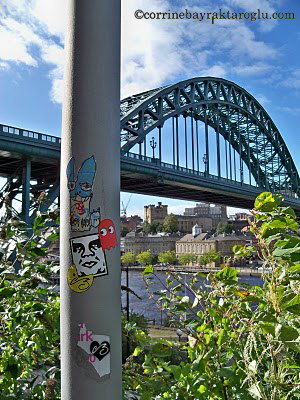 At the Tyne Bridge (Gateshead side) near The Sage (or known by locals as "the slug") and the Baltic Centre for Contemporary Art (used to be a working flour mill when I was a kid). It can be seen in a small part of the film "Get Carter" with Michael Caine. It was filmed when I was still living there, and a cousin of mine played an extra in the Oxford dance hall scene. Eldon Square and the birds continue to sing. I LOVED spending a little time in Eldon Square, brought back so many happy memories. Found this 1930'/40's postcard. Click on link here for more info. 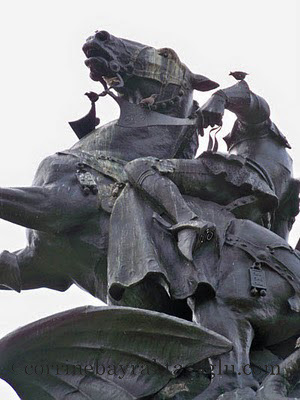 As the site states, the statue "figure represents St.George slaying the Dragon." 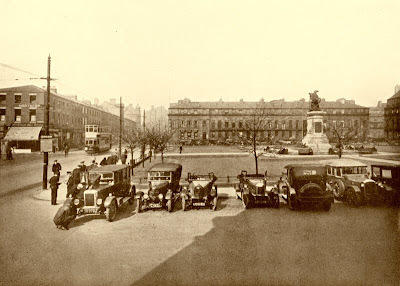 FROM HERE ON OUT: Eldon Square from jamie allen on Vimeo.